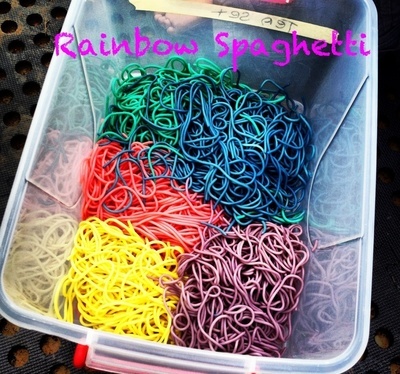 Perfect for sensory play - or if you are really game - tempting fussy eaters. Time: 35 minutes (prep time) if you are using it for play, you can make it a day ahead. Cook your pasta to aldenté, according to packet directions, you want your pasta to still be firm, not mushy. Meanwhile prepare a ziplock bag for each colour you want. Add a quarter of a cup of water to each bag along with 13 drops of colouring. The pack usually has a handy ratio chart for mixing colours. Once your pasta is cooked, drain and rinse under cold water to speed up the cooling process. 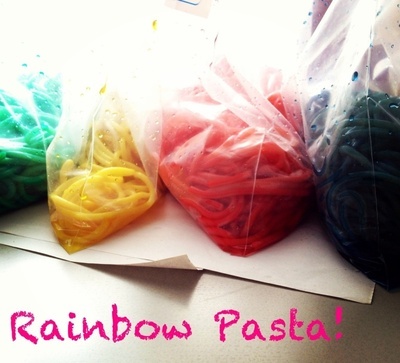 Add pasta to your ziplocks and shake around to mix the colour evenly through the pasta. Sit for 10-15 minutes to allow colour to seep in. Rinse again with cold water through a colander to remove any excess food colouring. Place in a shallow tub or play table for lots of squiggly sensory fun! More Articles by Honey, You Baked! view all articles by Honey, You Baked!